There’s been some talk about solar powered wineries lately. But what about wind power? 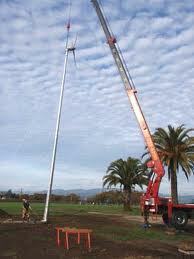 There are typically two ways a winery can use wind for their energy needs. It’s now possible for any size winery (in a suitably windy location) to use small wind turbines to convert wind energy into electricity. Due to the increased availability and affordability of small wind turbines—thanks in large part to the 30% federal Investment Tax Credit—the market is projected to grow 300% within as little as five years. Anaba, August Cellars and McCall are leading the way with turbines of their own. Alternately, for wineries that don’t want to or can’t purchase their own turbines they can choose to buy part or all of their wind energy directly from their existing utility company (called ‘green pricing’). Parducci Wine Cellars is well-known for its use of solar power. But, in 2008, Parducci transferred 100% of its energy needs to fully renewable sources by supplementing its on-site solar power with purchased Green-e® certified wind energy.